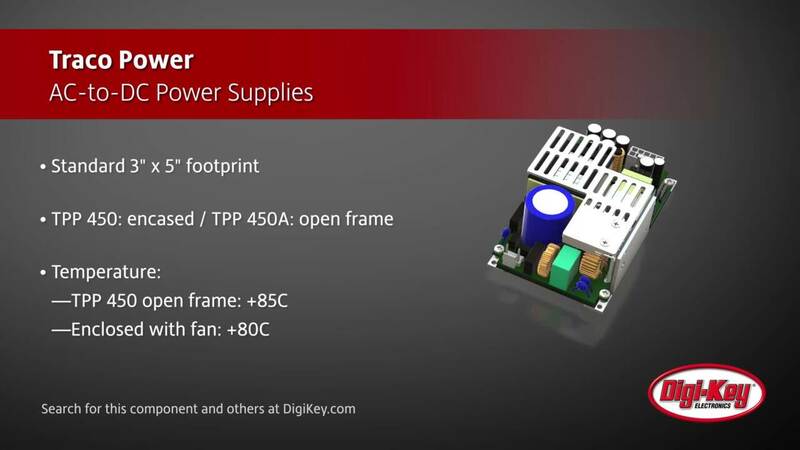 This presentation will introduce the TPP 450 Series of Medical and Industrial approved AC/DC Power Supplies, available in both open frame and fully enclosed with fan versions. This module will review the key features, ratings and characteristics of the TPP 450 Series. This training will also have an overview of medical guidelines for the Medical 2XMOPP ratings for Applied Parts and discuss how the TPP 450 series can help achieve system level compliance to IEC/EN/ES 60601-1 and a BF rating. ספקי-כוח AC/DC רפואיים ותעשייתיים מסדרות TPP 450/TPP 450A סדרות ספקי כוח AC/DC 450 W ‏TPP 450 ו-TPP 450A של TRACO מפיקות תועלת מתכן נצילות-גבוהה ומספקות ביצועים מעולים בחתימת שטח של &quot;3‎&quot; x 5.